Founded in 1973 by Dr. Leonard Lazar and Dr. Russell Reiss, General Digital was born in Len’s living room. As word got around at Rensselaer Polytechnic Institute, where they taught, many enlisted the exceptional engineering prowess of Len and Russ. Soon, with a facility in East Hartford, Connecticut, they were providing custom electronic production runs and software engineering services. Both sides of the business quickly grew and evolved, serving all manner of industries and armed forces. In 1977, General Digital created the VuePoint™, the world’s first gas plasma, flat panel, serial terminal with an integral touch screen, which then evolved into the VuePoint II™ and then the Smart VuePoint™. 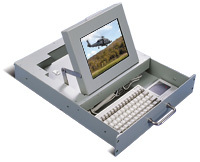 In 1992, long before anyone realized the benefits of such a design, we introduced the SlimLine™, a 2U high (3.50"), flip-up LCD monitor with an integral keyboard and pointing device, capable of passing military shock and vibration requirements. We also produced the first large format sunlight readable display capable of 27:1 contrast ratio in direct sunlight (GenStar™, 1998). 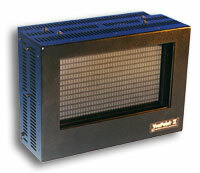 The GenStar monitor was selected to be the FAA’s STARS program primary tower monitor and continues to be to this day. Though many “copycat” devices are widely available today, only General Digital’s ruggedized, specialized and customized products are built to last for years, while offering the greatest flexibility necessary to keep pace in today’s rapidly changing marketplace. 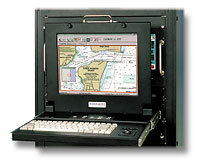 As a matter of fact, much of our VuePoint and VuePoint II product line is still in service today in the Printing, Flight Simulation and Powerplant industries, and many first-generation SlimLine units are still in use by the U.S. Navy. The VuePoint product line has proved to be so popular that a third-generation VuePoint III™ LCD terminal was developed and is being utilized by a whole new generation of users. Today, we continue to serve the marketplace with advanced design and engineering capabilities as evidenced in our diverse line of LCD monitors and associated hardware products, optical enhancements, contract manufacturing, and software engineering services. Our hardware products range from terminals to high resolution LCD monitors to fully integrated industrial/military visual systems. Whether your need is for an off-the-shelf flat panel LCD monitor or a state-of-the-art LCD display system, you can count on General Digital’s experienced sales engineers to assist you in every way possible. We will help you with product configuration, work closely with you in prototype development, and propose innovative solutions to meet your application requirements. For over 45 years, General Digital has solved the industry’s toughest flat panel display problems, while providing the kind of “old-fashioned” service that is rarely found in contemporary, high-tech firms. Being independently owned and operated, you deal with on-the-job, concerned individuals, including a professional sales staff and well-trained fabricators. We are large enough to handle most custom fabrication needs, but small enough to give each of our customers the quality service and respect they deserve. Throughout the 1990’s, General Digital experienced numerous successes within the FAA and Department of Defense. At the forefront of this success was the optical bonding process, whereby a filter or reinforced glass covering was married to the surface of an LCD module. The resulting improvement to contrast and ruggedization encouraged us to offer this feature on all of our products. However, while searching for sources of supply, it became apparent that there were few companies capable of offering optical bonding services for large format LCD’s. Faced with a lack of qualified suppliers, we set about developing in-house bonding capabilities. The success of this process and the engineering expertise gained from this experience prompted the creation of General Digital Optical Bonding Laboratories. As the newest operating group within General Digital, the Optical Bonding Laboratories is chartered with providing high quality LCD, OLED and Plasma display enhancement services to OEMs, Systems Integrators and the Armed Forces. It is our goal to become the premier supplier of flat panel display enhancement services. For over 45 years, General Digital Software Services has provided robust software verification and validation services. We specialize in the testing of embedded system software deployed in high performance, safety-critical avionics systems. We always provide our customers with an on-time, independent verification effort. Our group has earned an excellent reputation for meeting our customers' demands with our accurate, prompt and reliable software quality service. Let us show you how we can save you valuable engineering time, provide you with third party objectivity, and improve your bottom line. 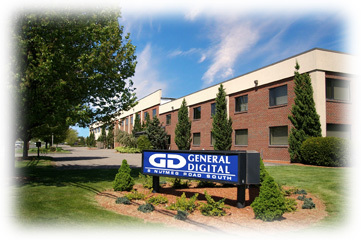 General Digital remains a proud entrepreneurial company with deeply rooted traditions of quality and service. We have evolved into the industry’s leader in innovative flat screen LCD display design, integration and enhancement. 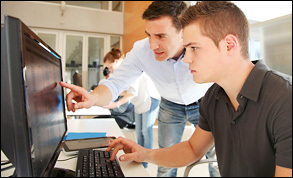 We continue to provide turnkey software solutions and consultative engineering services. General Digital stands as a strong, viable force in the industry, poised to meet the challenge of your specific needs. Deloitte and Touche chose us three times (2003, 2005 and 2006) for their prestigious Fast 50 Technology award. And we would like to note how grateful we are for our customers’ referrals of friends and associates to General Digital. General Digital is a United States government-registered SBA small business concern. We are registered with the System for Award Management (SAM), which was formerly known as Central Contractor’s Registration (CCR). We are also registered with the Small Business Administration (SBA). General Digital is registered with the Directorate of Defense Trade Controls (DDTC) pursuant to the Arms Export Control Act (AECA) and the International Traffic in Arms Regulations (ITAR Part 122). Our Registrant Expiration Date available upon request. General Digital Corporation’s products are compliant with the U.S. Federal Trade Agreements Act (TAA) and Buy American Act (BAA) for general U.S. Government contract awards and Government-Wide Acquisition Contract (GWAC) purchases.